With views of the Pacific from Costa Rica to Playa Majagual in the north, Los Suenos have some of the best sunset lookouts in San Juan. Most lots lie in a clearing on a soft incline between the treeline and the hilltop, each benefitting from the cool breezes blowing in from the ocean. Our Canopy lots, the parcels just to the south of Los Suenos, include views up into the forests on the continental divide and down to the Rana Caliente stream below. Social opportunities abound here, from the El Encanto Clubhouse and pool at the top of the hill to the TreeCasa Restaurant a few hundred meters down the road. Hiking and mountain biking trails surround Suenos, weaving through the Montecito and Mesas phases, and just west in our largest green corridor, Valle Encanto. 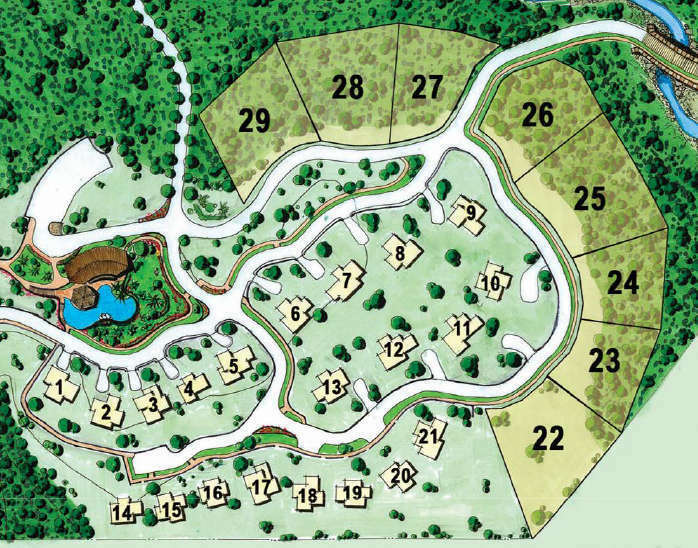 The 17 lots in Los Suenos and the 11 adjacent Canopy lots range from just under a quarter acre to almost an acre. Lots come ready-to-build with wells and water lines already in place. For power, we invite you to use El Encanto’s solar-powered micro-grid for all the benefits of renewable energy without any of the hassles.